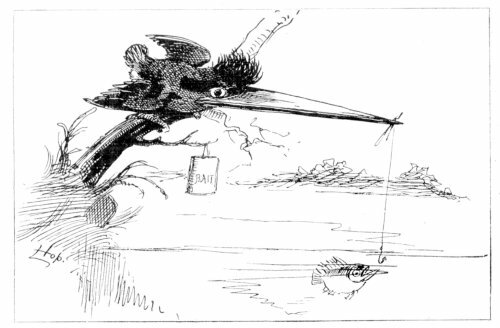 A fun vintage magazine image featuring a bird fishing. Our bird friend sits on a tree limb with a can of bait and a fish getting ready to grab his hook below the water. This fun bird cartoon is signed but should be copyright free based upon the publication date. Like so many other editions of this children’s magazine, St. Nicholas Magazine for Boys and Girls, Vol. 5, September 1878, No. 11 included a wide array of wonderful public domain images.